The city of Ketchum and its firefighters union are reporting progress in contract discussions, a process that has stymied both parties for years. Recent discussions, including two formal sessions on July 16 and 17, have been productive, said John Rathfon, Ketchum firefighter and president of the Ketchum chapter of the International Association of Fire Fighters. "I feel really good about how discussions went," he said Friday. "They went really positively, [and] not just positive in our favor. There was good movement on both sides. "I don't want to go into details why we're getting improvement. I think there was a lot of misunderstanding that we've been able to make progress on, on both sides. It's been great." Mayor Randy Hall said the meetings resulted in better understanding of each side's positions and how compromise might be reached. "The discussions went well," he said Monday. "We did clear up a lot of misunderstanding. Our employees are honorable people who have a difference of opinion on a couple of issues, and we're dealing with that." Hall said that although the city's position on central issues such as at-will work status hasn't changed, it is willing to amend some language in the employee handbook that would clarify policies and bring more objectivity to employment-related concerns, such as termination processes. "There will be some recommendations for the handbook ... to change the wording in a couple of areas," he said. "I'd like to take the subjectivity out." The contract issue dates back several years, when the city made changes to its employee handbook, including a change that gave all employees "at-will" status. That means an employer doesn't have to give a reason for terminating someone. It does, however, have to follow certain processes dictated by state and federal employment law, Hall said. The city's full-time firefighters had since 2005 been "for cause," meaning the city had to provide a reason before letting an employee go. That item proved to be the major stumbling block, though a half dozen other items also generated disagreement. 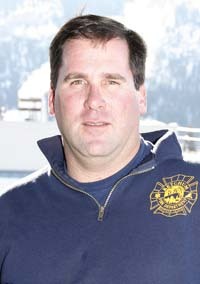 The firefighters' union, Local 4758, International Association of Fire Fighters, AFL-CIO, sued the city in April 2011. It alleged that the city was not entitled to make changes to terms and conditions of employment without union input while the parties were engaged in collective bargaining, that the city refused to engage in collective bargaining as required by state law, and that it refused to execute an agreement reached between the parties. "We aren't asking for anything we didn't already have," Rathfon said. For its part, the city has maintained that it was not required to continue discussing all unresolved issues after having met in good faith. Other sticking points included nepotism policies, residency requirements, layoff policies, compensation time and retirement, Hall said. Last fall, a judge ordered parties back to the negotiating table. "All we want to do is exercise our rights to collectively bargain for our working conditions," Rathfon said. But Hall said working conditions and employment policies shouldn't vary from one department to another. Therefore, he hasn't been willing to create a separate set of policies for one department while other departments are subject to the newer handbook. He said changes to the employee handbook, if carried out, would apply to all city employees. "I'm willing to make modifications to the handbook that will help all of our employees," he said. "We are steadfast that we treat all employees equally. We want to be at-will. We don't want to create separate cultures. I believe, at the end of the day, we're going to be able to work that out." Rathfon said attorneys are working on language for the way that at-will status could appear in their contract. Parties are set to meet again in September. "We're working through this constructively," Hall said. A hearing on a contempt-of-court motion filed by the union in June over the city's refusal to resume negotiations remains scheduled for Aug. 27 in 5th District Court with Judge John Butler. Union attorney James Piotrowski did not return a call seeking comment Monday on whether the union would now withdraw that motion.